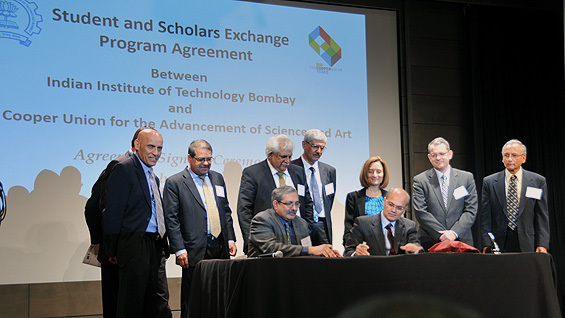 The Cooper Union and the Indian Institute of Technology Bombay have signed a Memorandum of Understanding to develop a student-exchange program between the Albert Nerken School of Engineering and the renowned engineering and technical institute. The Memorandum was signed in a ceremony in Cooper Union’s Rose Auditorium on October 26. Starting in the 2014 academic year, two students from each institution will enroll for one semester of study in the other institution. The students must be undergraduates in their junior or senior year, or graduate students enrolled in the home institution for at least one semester. The exchange students will come from any of the engineering disciplines common to both institutions: mechanical, civil, electrical and chemical engineering. The host institution will provide economical housing to the exchange students who will pay tuition only at their home institution. The participants will bear travel and living expenses. Ruyintan (Ron) E. Mehta, a graduate of IIT Bombay, has donated the cost of airfare for two IIT and two Cooper Union students for the first year of the exchange. "My wish is that no student be denied an opportunity to study in a foreign institution of equivalent prestige and repute based on his or her ability to pay,” Mr. Mehta said. “I have been the beneficiary of the superb education imparted to me at IIT Bombay and US Graduate schools at little or minimal cost and this is the least that I can do for other students."